Here is a round-up of today's proverbs and fables - and for previous posts, check out the Bestiaria Latina Blog archives. If you have not downloaded a free PDF copy of Brevissima: 1001 Tiny Latin Poems, it's ready and waiting. TINY PROVERBS: Today's tiny proverb is: Medium certum (English: The middle way is certain). POLYDORUS: Today's proverb from Polydorus is: Hylam vocat (English: He's calling for Hylas, alluding to Hercules who called out for his beloved Hylas in vain after the nymphs had stolen him away). PROPER NAME PROVERBS: Today's proper name proverb from Erasmus is Indoctior Philonide (English: Stupider than Philonides; from Adagia 2.6.30 - Philonides was a proverbial figure for being all brawn and no brains). GREEK PROVERBS: Today's proverb is Ὀυδὲ Ἡρακλῆς πρὸς δύο (English: Not even Hercules against two - that is, even Hercules does not fight two opponents at once). BREVISSIMA: The distich poster for today is Tempus. Click here for a full-sized view. 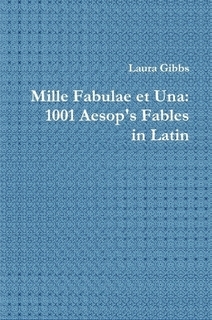 MILLE FABULAE: The fable from the Mille Fabulae et Una widget is Pastor et Canis Molossus, in which a shepherd economizes foolishly. 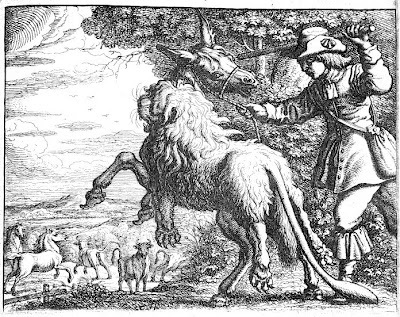 FABULAE FACILES: The fable from the Fabulae Faciles widget is Asinus Leonis Pelle Indutus, the famous fable of the donkey in the lion's skin (this fable has a vocabulary list). Words from Mythology. For more about GEOLOGY and GAIA, see this blog post.